In the photo (left to right): Blanche Goldstein, Laura Tucker 81C 85B 85L, Will Tucker, Michael Tucker 14B, Molly Tucker 17C, and Neil Tucker. Cementing an already powerful legacy, the Tucker and Goldstein families are endowing a new scholarship. 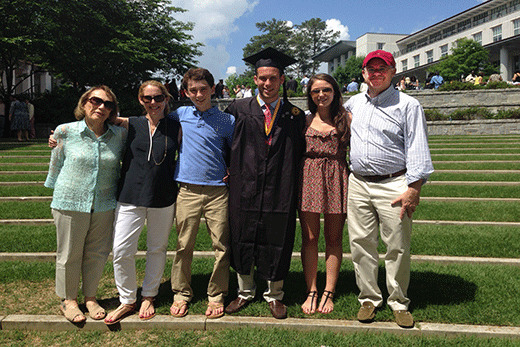 Their contributions are being doubled through the Emory College of Arts and Sciences’ Scholarship Endowment Initiative. The Tucker-Goldstein Family Scholarship is one of the first to be established through this new program, which matches contributions of at least $50,000 to create scholarship endowments. Siblings Laura Tucker 81C 85B 85L and Marc Goldstein 84C 87L are funding the scholarship along with their spouses Neil Tucker and Elaine Goldstein 86C and mother, Blanche Goldstein. For them, Emory is part of the family. The New Jersey natives both earned undergraduate and law degrees from the university. The Tuckers’ oldest son, Michael, graduated from Goizueta Business School with a bachelor of business administration degree in May 2014. Their daughter, Molly, begins her sophomore year at Emory in fall 2014. Elaine received a bachelor of arts degree in psychology from Emory in 1986. The Goldsteins’ daughter Jane, an anthropology major, is scheduled to graduate in 2015. Tucker, who unknowingly planted a seed that would grow into deep roots, arrived at Emory lacking enthusiasm for education due to her experience at a large public high school. “I viewed it as a system you had to get through to move on in life,” she says. Marc Goldstein often recalls fond memories of his time at Emory, and, like his sister, he appreciated the diversity and culture on campus. While Tucker may have hoped that her children would experience Emory for themselves, they could have taken another route. “It wasn’t, ‘I went to Emory, so you’re going to Emory.’ We looked at a lot of colleges, but the size, culture, and studies at Emory fit so squarely for both of them,” she says. Now Tucker and Goldstein hope that their gift enables other young students to choose Emory, regardless of their financial circumstances. While loyalty to and belief in Emory inspired them to create the Tucker-Goldstein Family Scholarship, giving back to an alma mater that gave so much to them ranked high on their list of reasons, too. As the intellectual home of most undergraduate students on campus, Emory College is leading the Scholarship Endowment Initiative. At the close of Campaign Emory in fall 2012, donors made significant investments specifically to help transform scholarship support at Emory College. Because of their generosity, gifts of at least $50,000 to the Scholarship Endowment Initiative at Emory College will be matched. To learn more about Emory’s Scholarship Endowment Initiative and how you can support student scholarships, contact Rhonda Davidson 82Ox 84B in Emory College of Arts and Sciences, 404.727.8002 or rhonda.davidson@emory.edu.